Rahal Letterman Lanigan Racing Technical Director Jay O’Connell will serve as Online Engineering Instructor for the next three weeks. An accomplished vehicle design and chassis development engineer whose expertise has been employed in Formula 1, INDYCAR and sports car racing over the past 15 years, O’Connell will offer advice on a broad range of technical matters. O’Connell’s answers will be posted daily from March 4 through March 17. Rahal Letterman Lanigan Racing Technical Director Jay O’Connell’s interest in race car engineering was spawned at a young age and first bore fruit in 1986 when he led a team of five at Brown University to design and build a Formula SAE race car. The project was completed in just 14 weeks and earned third place in the design category. 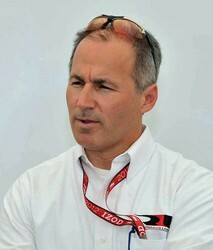 After switching to Cornell University, he led a team of 15 engineers which produced two more Formula SAE cars, finishing first in design in 1987 and first overall in 1988. O’Connell graduated that year with a degree in Mechanical Engineering, and began working for Ford Motor Company in product development. 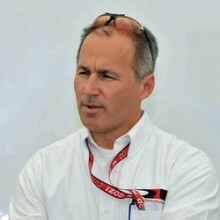 He became Ford Racing’s CART program manager in 1998, and three years later transferred to England to work for the Jaguar Racing Formula 1 team as head of Research and Development. He returned to Michigan in 2002 and continued in product development on the new Mustang program. In 2005 he was promoted to SVT Chief Vehicle Engineer and headed a team of 25 engineers to develop the Shelby GT500 Mustang as well as the suspension redesign of the Ford GT. The lure of racing enticed him back to the sport at the end of 2006 when he joined Rahal Letterman Lanigan Racing as technical director. The team captured INDYCAR poles and wins in the 2007 and 2008 seasons, and from 2009 through 2012 successfully raced the BMW M3 GT, capturing the ALMS manufacturer and team championships in 2010 and 2011, along with the driver’s championship in 2011. For 2013, RLL Racing will field as many as three cars in the IZOD IndyCar Series and develop two brand-new BMW Z4 GTE cars in the American Le Mans Series. “From Formula SAE to Formula 1 and the Indy 500, I look forward to answering questions about race car engineering, strategy, and how to be competitive at every level of the sport,” said O’Connell. Jay O’Connell answers your questions! When you visit a new race track for the first time, what tools do you have at your disposal to begin to figure out a proper setup? And how difficult is it to obtain the information you need? Would your answer differ for someone just starting out in the sport, who doesn’t have access to all the technical data? Before we go to a new track we try to get a speed versus distance trace from a similar race car to start a basic lap simulation study. Usually we can get this data from another team as we all try to help each other in this situation. If not we get a detailed track map with the elevation, pavement width, corner radius and straightaway lengths so we can calculate the predicted speed versus distance relationship. Then we use our simulation tools to determine the critical downforce-to-drag ratio, tire energy level and distribution, and basic sensitivities to weight, power and grip level. With all this information we can then put together a starting setup based on successful setups from tracks with similar characteristics. If you do not have access to simulation tools you can still leverage setups from other tracks that have corners with the same corner radius as a starting point. Hello Jay, Thanks for taking the time to answer these questions. I’m a young engineer (graduated with my BSME last May) dreaming of someday working in the world of open-wheel racing. I’m not aware of any sort of ladder system or development program for engineers like there is for the aspiring drivers. 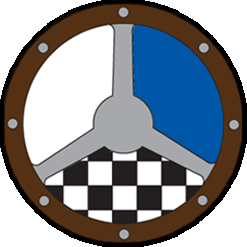 I’m wondering what sort of advice you might have for young engineers to “get their foot in the door.” I was captain of my school’s Formula SAE team and have now started volunteering with a professional team that runs USF2000 cars and Atlantics and Continentals in SCCA. How much knowledge and experience do upper level professional teams require engineers to have before considering them for a job? Thanks again. You are certainly off to a great start by transitioning from FSAE to USF2000, Continentals and Atlantics. IndyCar teams like ours are looking for engineers with experience and success in the Atlantic and Indy Lights levels that are looking to move up. The ladder system for engineers is similar to drivers and mechanics: start by engineering club racing cars at the regional and national level, then progress to engineering cars in professional racing classes. It is important to gain experience as a systems engineer (DAG) maintaining sensors and vehicle systems, as a damper technician building and maintaining dampers, as an assistant race engineer analyzing data (using Motec, Pi or similar software) and using simulation tools, and as a race engineer deciding what setup changes to make and working with the driver. In most smaller teams these roles are combined such that you may perform all of these jobs simultaneously. Another important area of experience to collect is meteorology. Professional race engineers need to understand the weather and how it effects the air density especially when racing at Indy and other oval tracks. Jay, I don’t own a race car but I do track-day my street car, a 2010 Mazdaspeed3. It has an adjustable rear sway bar. Turn-in and braking seems to be always predictable. My issue is pointing the car on corner exit under power. It wants to steer straight, not down the track. What set up options do you suggest? I understand your dilemma because I designed and developed the suspension for the 300hp front-wheel drive turbocharged FR200 Focus when I worked for Ford Racing. High power front-wheel drive cars are tricky to set up because you can understeer straight off the track if you apply full throttle too early in a corner. The front tires are overloaded in all three phases of the corner: entry, middle and exit. Your car really needs wider front tires (than the rear tires), lots of front negative camber and a much larger rear anti-roll bar to start to combat the inherent understeer in the vehicle layout. Successful FWD race cars often remove the front anti-roll bar completely (combined with much stiffer front springs) and tune the front differential to be open under braking and then progressively locked up under power. Without radically modifying your car, the best suggestion I have is to be patient with your throttle application and drive to the limit of the front tires. Thank you for taking the time to answer our questions. Mine is about strategy. How do you decide when is the optimal time to make pit stops – and are there differences in the determining factors between different series, such as ALMS and INDYCAR? How firm is your pre-race plan and how often, and why, would you tend to deviate from that plan? Race strategy is similar to playing chess: There are always multiple ways to play the game; it depends on what moves your opponent makes; and you need to keep your options open as long as possible. The strategy for ALMS and IndyCar racing on road and street courses is similar. Before the race we determine the minimum number of pit stops required if the race is all green, and then how many yellow laps are required to reduce the number of stops. We review various possible scenarios including the effect of an early yellow and a late yellow flag on the strategy options. If we qualified up front we will be more conservative than if we qualified at the back. Because of these variables the pre-race plan is not firm but more of a decision guide to help us make the best choices during the race. For example, if it looks like there is a full-course yellow coming, and our car is near pit in, we try to dive in and beat the yellow before the pits close because after the yellow we will be ahead of all the cars that pit during the yellow. The first lap you can pit and make it safely to the finish is also a critical decision point to determine before the race because any full-course yellow after this point can help your track position. There are many aspects to consider but hopefully this gives you some insight into race strategy! I’ve heard some engineers say they prefer drivers to concentrate simply on driving the race car and leave all the technical aspects to the them. How important do you think it is for a driver to have a good technical understanding of his race car? It is helpful when the driver has a good technical understanding of the car up to the point where the driver tries to engineer the car from the cockpit. Drivers build up experience with each setup change and how it affects the car. The best drivers remember each change in detail and build a database in their head which can be very helpful. Often a race engineer will give the driver two options to fix a handling problem and the experienced driver can help make the best choice by drawing on his experience. When an engineer and driver work together this way they build confidence in each other and often get even more performance from the car. Hey Jay. If you had to choose one, what do you think is more important: going to a well-known engineering school or gaining experience through hands-on experience working with a race team – for example, being a pit crew member etc.? The reason I am asking is I am doing really well in school but find it impossible to get into a great tech school because I have no idea how I am going to afford it. Thanks! I think the answer depends on your dream racing job. Do you see yourself as a race mechanic or a race engineer in the future? In either case you need hands-on experience working with a race team as a crew member to succeed. Going to the most well known engineering school is probably not as important for racing as it is for other careers in engineering. I would put more value on attending an engineering school that has a very strong Formula SAE program, with a good program advisor, as you will learn more about designing, building and racing cars while you are getting a degree. Learning how to machine, fabricate, lay-up composites and weld parts together is just as important as learning how to design them from basic principles. With both skills combined you will be an asset to any race team in the future. What is your favorite Indy moment? My first race at Indy was in 1985 and is still my favorite. At the time I was 18 years old and working as a photographer’s assistant for Sports Illustrated (there has to be another story here – Ed). I watched the start from the Pagoda roof and then worked the pit lane for the rest of the race. The area behind the pit wall was much narrower back then and very crowded as a result. At one point A.J. Foyt’s car had a problem and he retired from the race. I specifically remember A.J. jumping out of his car and then storming down the pits, helmet still on, and everyone scrambling to get out of his way. Of course the race was made famous by Danny Sullivan’s spin-and-win passes. Late in the race Danny passed Mario Andretti in Turn One and then spun around 360 degrees before entering Turn Two, losing the lead to Mario, and then passed him again in Turn One a few laps later to win the race. I was in Mario’s pit hoping to photograph the winning team but of course he finished second instead. It was a great introduction to IndyCar racing and I always remember these moments when I return to Indy each May. From an engineering perspective, some race tracks seem to place an emphasis on aerodynamics – for example, straightline speed on superspeedway ovals or somewhere like Road America – whereas others, like Mid-Ohio, are more dependent upon mechanical grip to produce the best lap times. On many other tracks, perhaps the emphasis isn’t quite so clear cut, so how do you determine which setup options are most appropriate? We use simulation tools to determine the critical L/D (downforce to drag ratio) for each race track. Most road racing tracks in the USA favor downforce over drag unlike Le Mans or Monza in Europe where top speed is more important. Even at Road America there is not usually a significant benefit to reducing drag because the downforce loss hurts lap time more due to the high cornering speed through the carousel, the kink, the last turn and Turn Three – all of which lead onto long straights. Back when Champ Car raced at Elkhart some teams would trim slightly for qualifying, when the extra grip from the new tires could make up for the loss of downforce, but then put the downforce back on for the race with full fuel levels and worn tires. What is your take on the fresh emphasis being placed on technical regulations based upon fuel economy, especially in sports car racing? Wasn’t that one of the criticisms leveled at Champ Car and INDYCAR a few years ago – that the races had “degenerated” into fuel economy runs? No matter how they write the regulations there will always be a fuel economy angle in a race where you need to add fuel to finish. Each team works backwards from the end of the race to determine when the window opens to be able to make the finish – basically a fuel economy run to the end – without making another pit stop. This is because the first car in the pits, for the last time before the finish, will gain a track position advantage if and when a full course caution occurs in the last stint (which happens fairly often). Any cars that have not stopped yet will pit under the yellow and cycle behind the new leader. There is more emphasis on fuel types now in sports car racing because it makes racing more relevant to OEM’s, governments and fans due to the technology transfer from racing to road cars. I do all of my racing on the computer using iRacing. My biggest frustration is getting a car set up to work for my driving style. Are there any good books or websites that cover the basics of car setup? I mostly race stock cars, but do dabble in the Indy cars too. I am not familiar with iRacing specifically, but I have tried a several similar racing games where you can adjust the setup parameters. The simulation models used in the racing games continue to become more and more realistic with each new release but are still far from reality. Without knowing your driving style it is difficult for me to suggest specific setup recommendations, however I suggest you make big changes at first to get a feel for individual effects of: anti-roll bars, springs, ride heights and wing angles (on the Indy cars). The track models do not capture the bumps in the track so you should be able to go faster with stiffer springs and lower ride heights without trading off grip. There are several books available that cover the basics of car setup including “Tune to Win” by Carroll Smith. In one of the later chapters Carroll includes a basic handling problem/solution look up table which is very useful. Being a very experienced race car engineer, what type of information do you look for from a driver – that gives you the best understanding of what the car is doing and how to improve it? Thanks for your time. There is a lot of information coming from the driver since they are the most sophisticated sensor in the car. The best drivers tell us the car’s balance corner by corner, as soon as they get back to the pits, and what they need to go faster (i.e. more stability, more grip, better traction, etc). This allows the race engineer to quickly decide what changes to make for the next outing. After each practice session the driver fills out a written report which breaks down each corner into the entry, middle, and exit phases to provide further detailed feedback. The driver and engineer review the report together, along with the data from the car and the car set down information, to get the best understanding of what the car is doing. Then they prioritize the problems and determine the setup changes for the next session. No matter how they write the regulations there will always be a fuel economy angle in a race where you need to add fuel to finish. Each team works backwards from the end of the race to determine when the window opens to be able to make the finish – basically a fuel economy run to the end – without making another pit stop. This is because the first car in the pits, for the last time before the finish, will gain a track position advantage if and when a full course caution occurs in the last stint (which happens fairly often). Any cars that have not stopped yet will pit under the yellow and cycle behind the new leader. There is more emphasis on fuel types now in sports car racing because it makes racing more relevant to OEM’s, governments, and fans due to the technology transfer from racing to road cars. Dear Mr. O’Connell, What was the most common change that you would find most beneficial to a car’s overall balance – something that you can reliably resort too when you needed to make a change? Thanks! The most common change for overall balance is adjusting the front or rear anti-roll bar stiffness. In general if a car is understeering you soften the front bar or stiffen the rear bar, both of which move the roll stiffness distribution rearward, and if a car is oversteering you soften the rear bar or stiffen the front bar to move the roll stiffness distribution forward. This is why race cars have driver adjustable anti-roll bars, when the rules allow it (for example in INDYCAR), to give the driver the most effective balance adjustment tools. Spec Racer Fords have what I think are small front and rear sway bars. Most cars are set up with the front bar at full stiff and the rear bar almost full soft. In the rain, I have been told to disconnect the rear bar. When I do that, my car tends to “push” more; it’s hard to break the rear loose – almost like the front has too much grip. In which direction should/would I move the sway bars? Thanks. Disconnecting the rear bar in the rain is a good idea, because the rear suspension becomes more independent and has better traction when the track grip level is low, but you should also soften the front bar at the same time to maintain the overall front to rear mechanical balance. It makes sense that your car tends to understeer with the rear bar disconnected, and no change to the front bar, because the front roll stiffness percentage is higher than your baseline setup. It is harder to break the rear loose because the rear has more grip with the bar disconnected, not because the front has too much grip. I suggest that you measure or calculate the effective bar and spring stiffness’s at the front and rear wheels. Then you can determine the front to rear roll stiffness distribution with your preferred dry setup. Finally, you can determine how much to soften the front bar, when you disconnect the rear bar in the rain, to maintain the same stiffness distribution. My son has been racing karts for five years and is just beginning to make the move into cars. From your standpoint as an engineer, what should be his focus and do you have any specific tips for him on how to best prepare himself for moving up the ladder in the future? The move into cars is a big step because there are many more setup changes to experience including suspension and aerodynamic systems. Karting is great for getting started at a young age; it is relatively affordable and perfect for developing good driving skills, but setup changes are limited. The best tip I can suggest is to read “Drive to Win” by Carroll Smith for an engineering perspective regarding the technical information your son should learn as his driving career progresses. Jay, I drive a Cayman S race car in a few different amateur club racing organizations on a regular basis. What would you recommend to focus on the most in regards to qualifying and race strategy/setup in a class that generally has 10-20 cars. My buddy and I share two mechanics to help crew for us. Thanks. Sounds like you are having fun running your car in PCA and NASA type club races. Qualifying well is very important for the short races so I suggest that you optimize your car for qualifying by installing new tires and running the lowest possible fuel level, without stumbling by the end of 5 or 6 laps. Usually the third or fourth lap on a new set of tires is the best lap you will ever get out of them so there is no point in using new tires for the practice sessions – save them for qualifying. Make sure you have enough space, to the other cars on track, to drive a perfect traffic free lap on the third and fourth laps to get the maximum grip from the new tires. You could also try increasing front and rear negative camber 0.5 degree for qualifying, to get even more grip, but then backing them off for the race so the tires last longer. There is a balance between hurting the tires in qualifying, by qualifying faster with excess negative camber, and minimizing the tire grip degradation during the race with less negative camber. I know that the setup of a car can be changed dramatically between qualifying and the race, especially for an Indy car. Why is that and can you please detail some of changes that you might make? The setup changes between qualifying and the race in IndyCar depend on which type of track you race on. For example on a road or street course the changes are minimal: increase ride heights slightly to avoid bottoming under full fuel load, adjust the rear wing flap gurney shape or flap angle and adjust front wing to balance, and open the radiator inlet shutters for additional cooling. However, on an oval, especially Indy, the changes are more dramatic mainly because running alone in clean qualifying air is very different from running in a pack of dirty air in the race. Basically, an Indy car needs more front wing to reduce aero understeer when running behind another car than when running alone. However, the driver cannot adjust the wing angles during the race (only when in the pit box by a crew member). Instead the driver’s adjust the weight jacker (a hydraulic cylinder between the right rear spring that adjusts the cross weight) and the stiffness of the front and rear anti-roll bars when they are in and out of traffic to maintain a good balance. The setup for the race is therefore necessarily more conservative than the qualifying setup because of the increased stability required in traffic, and the effect of worn tires late in a fuel stint. How does negative camber and caster affect grip and tire wear differently in AWD vs. front wheel drive vs. rear wheel drive? Specifically with a car to be used on Autocross and track days but daily driven. If you are autocrossing or tracking your daily driver you are going to have to compromise on the alignment or come up with a quick method to adjust the setup at the track. Ideally you would like low negative camber on the street to minimize tire wear (stock alignment settings) and then significantly more negative camber at the track (for increased grip when cornering at the limit), no matter what the drive layout. All wheel drive, front wheel drive and rear wheel drive layouts imply various front to rear weight distributions and, of course, which tires are working multiple jobs. For example, front wheel drive cars typically have about 58-62% front weight and are asking a lot from the front tires, while front engine rear drive cars have about 50-54% front weight and have more balanced front and rear tire functions, and mid-engine rear drive cars have about 42-46% front weight and ask more from the rear tires than the fronts. All wheel drive cars are typically front heavy, especially Audis where the entire engine block is ahead of the front axle (a reversed 911 4WD powertrain layout), and can have anywhere from 50-60% front weight. The optimum front and rear negative camber values for maximum grip will vary depending on the drive layout and suspension type, but in all cases I would start with more negative camber at the front than the rear to offset the designed-in understeer (see my answer with my M3 and 350Z track setup for settings). Front caster values are reasonably high these days on most street cars such that you get some negative camber when the outside wheel is steered into a corner. You can increase the negative camber in turn, and reduce understeer, by increasing front caster but be aware that you are also changing the front roll steer (reducing roll understeer or toe-in in bump) which is OK up until you have roll oversteer due to toe-out in bump. What would be your general setup approach for a car that has the engine behind the rear axle so it has a lot of weight in the back and very little at the front? My first car was a 1970 Porsche 911 so I have setup experience with the engine in the rear and how it wants to lead whenever you lift off the throttle in a corner. Beginning with the 964 chassis, and then really with the 993 chassis, Porsche fixed most of the transient handling issues with a more advanced rear suspension system than the original 1964-1989 semi-trailing arm design. Regarding general setup for a rear engined car, I recommend for track use that the rear tire width is 20 mm more than the front (unlike the square wheel and tire setup that works well on an M3 or 350Z). The only time I have run 911s with a square wheel and tire setup is for low speed autocrossing where a slight oversteer balance works well. The other key for a rear engined car is to make sure the aerodynamic center of pressure stays behind the center of gravity at all speeds by installing a rear spoiler or wing. It is no surprise that every Porsche GT3 comes with a rear wing installed. Rear toe-in is also particularly important for braking stability in a rear engined car, so start with at least 0.5 degree total rear toe-in. In 2007 we raced a 997 RSR in ALMS and often ran up to 0.8 degrees total rear toe-in for braking and corner entry stability. The rest of the setup will be similar to front or mid-engine rear drive cars. Good to hear from you David – I hope all is well in Ann Arbor, Michigan. Of course we use your Raetech coil over spring load cells on our ALMS cars to measure the spring loads! We then convert these to wheel loads so we can measure and decide how to adjust the aerodynamic center of pressure. It is important that the center of pressure is close to, but behind, the center of gravity for adequate high speed stability. If the center is too far rearward then the car will have high speed understeer. On our IndyCars we use strain gauged pushrods, instead of coil over load cells, to measure the wheel loads and determine the same center of pressure. What would be your suggestion of damper/spring ratio for a sports car? Is there a way to calculate an approximation given the weight of a car or any other data? Yes, there is a formula for calculating the wheel rate required to achieve a certain ride frequency: f = (1/(2pi))v(K/M) where f = frequency, K = wheel rate, M = sprung corner weight (corner weight minus unsprung weight). The question is what ride frequency is appropriate for a sports car? Luxury cars typically have ride frequencies of 1.0 to 1.2 Hz, regular cars 1.2 to 1.5 Hz, high performance cars 1.5 to 1.7 Hz, street/track cars up to 2.5 Hz, race cars 2.5 to 4+ Hz depending on how much downforce they produce. Of course, the ride gets progressively harsher and stiffer as you increase the ride frequency – try driving an ALMS or IndyCar to work someday! Once you choose a frequency, and determine the wheel rate, you calculate the spring rate by using the square of the motion ratio between the wheel and the spring. For example, let’s say you have a 3100 lb BMW M3 street/track car with 50/50 front/rear weight distribution and want a 2.0 Hz ride frequency: the total weight with driver and some fuel is 3300 lbs, so the corner weight is 825 lbs, the unsprung weight per corner is 75 lbs, so the sprung weight per corner is 750 lbs; using the formula above the wheel rate =306 lbs/in, and with a front spring to wheel motion ratio of 0.91 the spring rate = 370 lbs/in. Now, for the damping, you need to decide how critically damped you want the system. Luxury cars have less critical damping than sports cars which have less critical damping than race cars. 100% critical damping = 2 v(K*M) with the same inputs as above. Back to the M3 example lets say you want 70% critical damping: using the formula, 100% critical damping = 49 lbs/in/sec, so 70% = 34 lbs/in/sec, and with a front damper to wheel motion ratio of 0.91 the damping force required = 41 lbs/in/sec. Of course this is a simple example and there are lots of opinions and experience in the field of vehicle dynamics about the level of rebound versus compression damping, low speed versus high speed damping, position sensitive damping, frequency dependent damping, and g-level sensitive damping which you can spend an entire career optimizing if you work in vehicle development. How can a young engineer get into motor racing? Teams seem to be very opposed to hearing about internships, so how can we enter the sport? Racing teams want engineers with experience which makes internships difficult. In addition to getting involved in Formula SAE, I suggest that you volunteer for smaller club racing teams and help out however you can to gain experience. I started working on an SCCA DSR class sports racing car while still in college as a volunteer, and then continued after graduating working for free as a crew member on Firehawk cars, IMSA GTU cars and World Challenge cars. With each race weekend and each team I gained experience, learned about the series, the tracks and the cars. Go to the closest race track during an SCCA race weekend and offer to work for free. Most small teams are happy to have an extra hand especially if you can add some engineering value. When you first engineer a race car, what are key elements in that process? The first elements I consider when first engineering a car, in order of importance, are: stability, precision and agility. High speed stability is the first priority, as mentioned in a previous answer. Closely related is braking stability – the car must be stable under limit braking from high speed which requires adequate rear toe-in, proper brake balance and some rear anti-lift geometry to keep the center of pressure from migrating forward. The next priority is precision from the steering and suspension system such that the driver gets an immediate and linear vehicle response from steering inputs with friction free torque feedback through the steering wheel that is in harmony with the response. This is a function of many design parameters and high quality parts from the tires all the way to the driver’s hands. The third priority is agility which means a very low level of understeer, especially at low speeds, and the ability for the driver to adjust the line when near the limit. This is typically the hardest element to achieve but also the most rewarding because, when combined with good stability and precision, it allows the driver to attack each corner with very high confidence and consistently put together the quickest possible lap times. What kind of information do you look for from a driver at the end of each session? Building on the previous answer, we ask our drivers to fill out a corner by corner score sheet after each session including a breakdown of the entry, middle and exit phases of each corner. Specifically we want to know about high-speed stability, braking stability, steering precision or control, and mid-corner balance in low, medium and high-speed corners. The more specific the feedback, with descriptive adjectives, the better we can address their concerns with setup changes before the next session. When you made the move to Formula One with the Jaguar team, how different did you find the environment compared to what you had known in IndyCar? Were there any major surprises? The biggest difference between IndyCar and Formula One is the scale of the project and the cost of the parts. When I moved from one series to the other in 2001, the operating cost in IndyCar was about $300/mile and in Formula One about $4,000/mile. The Jaguar team had 300 members, which was a good size F1 team back then, but now the big teams are nearly 1000 people strong. With the scale and the high cost comes a lot more stress on everyone to perform. At the time the Jaguar R2 was off the pace at most tracks, besides Monaco where it was competitive and finished on the podium. The surprise for me was that when I arrived and asked the engineers where we were missing the lap time I got every answer from driver to engine to aero to chassis. So, I helped with some in-car video analysis, using qualifying video from the pole lap versus our best lap, to identify where we were losing each tenth of a second of lap time. This analysis helped focus our development efforts to fix the biggest problem. Formula One is the same as every other racing series in that every detail matters to get the most performance out of the car. With at least four different drivers on your two-car team for most of the American Le Mans Series races — and presumably some differences of opinion on how they each like their car to handle — how much do you have to compromise on setup? And how do you decide which of the drivers will be “disadvantaged” the most? For sure there are different driving styles and setup requirements for our ALMS drivers. For example some drivers prefer a very neutral setup (drivers that tend to roll speed into corners) while others want some understeer for increased stability (drivers that brake later and get back on the power more aggressively). Where possible we try to pair up drivers with similar styles to minimize any setup disadvantage. During the practice sessions we adjust the balance and stability for each car independently. Inevitably, however, the drivers converge on a more common style at each event when they see one or the other style working better in each corner (by overlaying the fastest laps and carefully reviewing the data). During the race the drivers are more tolerant of setup issues because they just focus on making the best they can of the situation. Hi Jay, I am a relatively new club racer. I race a Spec Racer Ford in the San Francisco region. I think I have my set up close, but what is the relationship between tire pressure and negative camber? For example, if I can run a higher tire pressure, should I be able to have less camber? Tire pressure and camber both affect the vertical spring rate of a tire: typically, both more negative camber and less pressure drop the spring rate and increase grip. Both of these changes also increase drag, so if you are setting up your Spec Racer for Bonneville you may want to run more pressure and less negative camber but not for Laguna Seca or Sears Point. I suggest that you experiment with pressure and camber changes, with a close eye on your tire tread temperatures and tire wear measurements until you find the optimum settings. If you end up running more negative front camber, you can toe-out the front wheels to eliminate the small amount of drag added which is important in a Spec formula class where all cars have the same power. Hello Mr. O’Connell. I race in amateur events in Southern California with my 2006 350Z. I have fully changed my suspension components to adjustable aftermarket parts along with other modifications that I won’t get into for the sake of being brief. I have also brought down my vehicle weight from 3330 to 3150 lbs. I am planing a complete corner balancing and race inspired alignment soon at my local shop, and I was hoping you can offer some advice on my setup. I am looking to get a baseline setup with camber, toe and caster and a good weight distribution on the car. I am very familiar with the effects of the adjustments on vehicle characteristics, and I know that the track that is being raced on is very important as well. I am just looking for a good setup that will work well the majority of the time. I hold a Master’s degree in Structural Engineering and I understand many technical aspects and language. As of right now I am thinking to get as close as possible to 50/50 front to back, 50/50 diagonally on weight distribution. I would like the stock caster of 7.0 degrees (I believe), 2.5 degrees camber all around, 0.1 degree toe out in front and 0.1 degree toe in at the back. This comes from previous alignment experience, and any advice you can offer from your vast racing experience would be much appreciated. Thank you. I have a 3100 lb 2005 BMW M3, which I take to Mid-Ohio for lapping days a few times a year, so I can relate to your project. For sure adjusting the corner weights – with you or ballast equal to your weight in the driver’s seat – is a good step forward. Unless you move components or the wheels fore/aft you will not be able to adjust the front-to-rear weight distribution. However, you can adjust the weight on each diagonal until they are equal by adjusting the spring perch heights (I assume you have threaded collars on your aftermarket dampers). Before getting to the alignment details I suggest a square wheel and tire setup, which means the same width front and rear wheels and tires, to reduce the designed in understeer. For example I use 19×9.5 BBS wheels and 265/30ZR19 Michelin Pilot Sport Cup tires at all four corners on my M3 at Mid-Ohio. Most street cars are setup to understeer, for safety reasons, but burn their undersized and overloaded front tires off when driven at the limit on track. Unless you have a highly modified engine producing more than 450 hp you do not need wider rear tires for road racing your 3100 lb car. Regarding the alignment I suggest at least 1 degree more front negative camber than rear, again to reduce understeer, perhaps start with -3.5 deg front and -2.5 deg rear, and more front toe-out and rear toe-in. Your stock 7 deg front caster is OK, more would help reduce low speed understeer, but adding more will also change the bump steer. Again, for example, I run -3.85 deg front camber, -2.5 deg rear camber, 0.3 deg front toe-out and 0.3 deg rear toe-in but my car has strut front suspension and needs even more camber help than your double a-arm equipped 350Z. Springs rates and shock forces for your car are another whole discussion which I will cover in another answer later. Finally I suggest you add whatever lift eliminating or downforce generating aero devices you can for the rules in your class. Again for example on my M3, I install large front dive planes and a full width 10.5″ chord rear wing, mounted as high as the roof with large endplates and a 3/4″ gurney, which is worth 2+ seconds per lap at Mid-Ohio on top of all the other modifications. Although these parts produce only a fraction of the downforce that our ALMS or Indy Cars have, the effect is still significant in medium and high speed corners. Hi Jay. If a car is pushing on corner entry, can it be somewhat corrected with tire pressure? How? Yes, corner entry understeer can be reduced by adjusting tire pressure – reducing front pressure typically increases front grip depending on your starting point – but this may not be the best remedy for the situation. Each tire has an ideal hot pressure where it delivers the most grip for a given rim width, camber and vertical loading, so ideally you try to hit the ideal hot target and then tune other chassis parts – aero, ride height, alignment, dampers, springs, bars, roll center heights – to achieve the best balance. While reducing front pressure typically increases front grip, it also increases lateral movement of the tread relative to the rim which will slow down the front end response to driver input and may feel like more entry understeer. My question has to do with J-Dampers. I understand that they are basically flywheels that spin up and spin down with suspension travel. Since the inertia goes up with the gear ratio squared, you can increase the inertia of the suspension/wheel combo without adding much weight to the overall vehicular weight. However, I always thought that unsprung weight was a bad thing, but the J-Damper effectively increases unsprung weight. I can see that making the unsprung weight react more slowly to a step height change might be a good thing, but once it’s in motion it wants to stay in motion, so that seems like a bad thing. Could you explain why J-Dampers are a good thing? Thanks. Yes, unsprung mass is bad but, as you note, inerter dampers create effective unsprung mass while only adding a small amount of actual unsprung mass, which reduces tire contact patch load variation and ride height variation – both of which increase grip. The inerter dampers are unique because their forces change with acceleration, unlike conventional dampers which are displacement and velocity dependent devices. A car with inerter dampers feels more controlled on track and the drivers can take curbing inputs with more confidence and speed as compared with conventional dampers. So, in summary, they are good for grip but bad for your budget due to the extra complication and expense involved in producing them. Also, if the flywheel system fails during a race, the damper can lock up solid and ruin your day in dramatic fashion. Since there are very few if any degrees in motorsports, how did mechanical engineering prepare you to work on vehicles and race cars? And what path/experiences would you recommend to a future mechanical engineer who wants to design vehicles and work as a motorsports engineer? I knew I wanted to work on cars so I focused my mechanical engineering degree at Cornell toward automotive, instead of aerospace, to better prepare myself. Specifically, I took elective courses in engine design and automotive engineering, and participated in the Formula SAE competition for three of my four college years. Formula SAE is a student engineering competition where you have to design, build and race a formula style race car using a motorcycle engine, slick tires and a full suspension system. While there are numerous safety rules there is no minimum weight which is unique in motorsport. Formula SAE became my college major and taught me how to design, weld and machine parts, assemble and develop race cars, and work in a team environment toward the goal of winning a championship. I highly recommend that you attend a college/university with a strong FSAE program to gain similar experience. If you can work for a race team at any level when you graduate, great. If not, I suggest that you start out working for an automotive OEM or supplier and volunteer for local race teams on the weekends to gain experience. Hi Jay. I would like to know if most or all teams build their own shocks and springs? Also how many motors will a team use in a season and at what cost? The answer depends on which racing series you are asking about. In IndyCar a couple of teams design and build their own shocks, but most teams use available top brands – Ohlins, Dynamics or Penske dampers – and most teams purchase springs from top suppliers such as Hyperco or Eibach. Our IndyCar team uses a hybrid approach: we start with Ohlins dampers and then produce our own internal parts to reduce friction and give us a wider tuning range. Most teams check the rate of all the springs they buy so they know exactly what they have instead of assuming the listed rate is correct. The situation is similar in American Le Mans Series sports car racing where most teams use the same brands of dampers and springs as IndyCar. In Formula 1, however, more teams produce their own shocks and most teams produce their own springs especially if they use torsion bar springs instead of conventional coil springs. Regarding engine use, the 2013 IndyCar rules specify each engine last 2000 miles and penalizes early changes with 10-place post-qualifying grid penalties. IndyCar season mileage is also limited to 10,000 miles so you should only need five engines, which is what most teams used last year. The engine lease cost is also set by IndyCar and works out to about $130,000 per engine. The actual cost is only known by the engine manufacturer. ALMS is similar since the engines are designed to last 24 hours before service (about 2400 miles) and the season mileage is about 10,000 miles, but there is no limit on the number of engine changes, season mileage, or engine lease cost. Formula 1 also has limits on the number of engines used per season (I think it was eight the last few years) but I am not as familiar with the latest rules.